When it comes to Indian figured silks, Baluchari sarees come second only to Banarasi brocades. While the two are very similar in terms of technique employed in the weaving and finish, Balucharies are characterised by supplementary-weft or -warp borders and the untwisted silk threads that constitute the fabric. The latter is in stark contrast to the generous proportions of zari that go into the Banarasi brocade. This statement pink number is a fine example of the Baluchari silk. Having emerged from the complicated multi-warp and multi-weft drawlooms found in Bengal's Murshidabad district, the sheer amount of skill and labour that has gone into this work is obvious from its great beauty. Balucharies are known to tell a story. 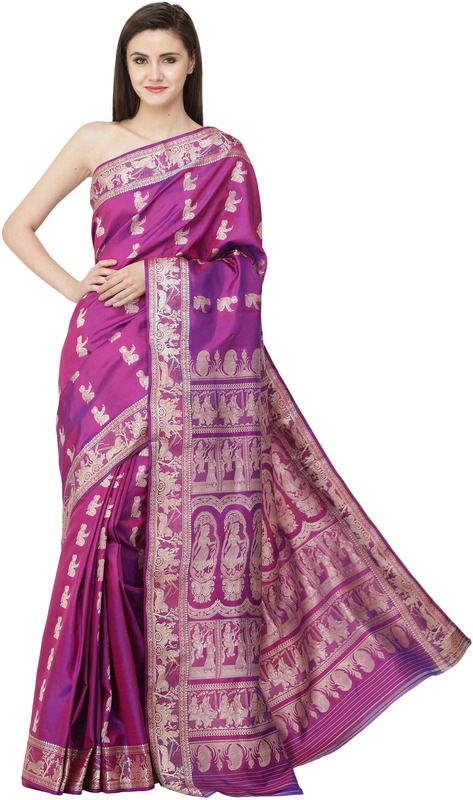 The endpiece of this variety of Indian sarees are embroidered with contrasting coloured threads, such as pale gold against the deep shimmering pink of this one. Repetitive panels depicting moments of Radha-Krishna's togetherness are punctuated by rows of minsicule paisleys on the endpiece, and a panel of the lone Radha dancing runs through the centre. The border despite the narrowness is intricately embroidered with scenes from the Gita, as is the norm with these BEngali silks. As gorgeous as Indian silks get, we suggest you team this with the best of your gold hand-me-down pieces.